It’s embarrassing how long it’s been since I’ve blogged. I’ve thought about. I’ve started posts. I’ve crafted. But I’ve not actually put anything on this blog since… well let’s just say it’s been too long. So, here is something I’ve been working on for some time now and someone got me off high center by asking how to make them. The easiest way to tell them is to blog about it. These are pretty easy. I think they’re easier to make than it was for me to get this blog committed to paper. Well, to digital paper, whatever the term for that is. I started working on it (not counting taking the photos, but counting getting them ready to post) Sunday afternoon and am just now done and ready to publish if that lets you know. And I really did work on it most of today. Maybe I’m just slow and out of practice. Fortunately I have some ideas for things and things I have made since I have been off. I haven’t exactly been lollygagging. Not entirely. Anyway, here is a tutorial on how to make my sock babies. 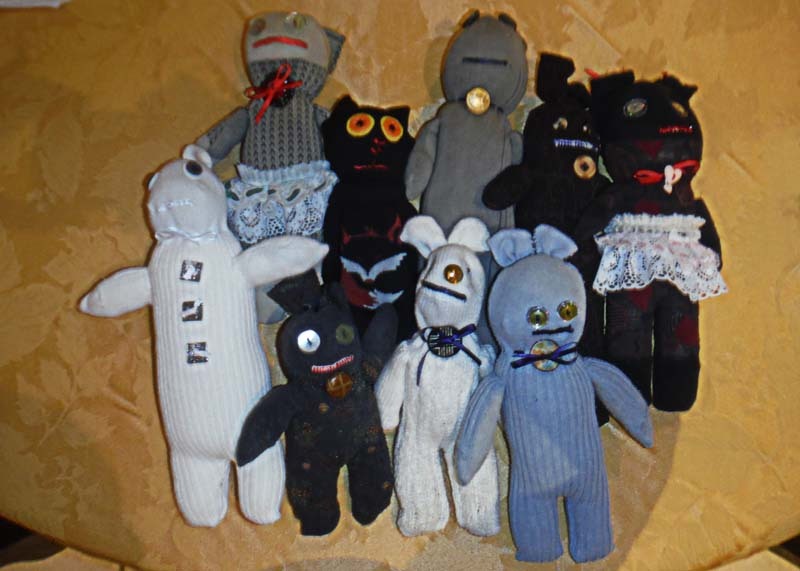 They grew from the sock bunnies I posted last year. And they have evolved into something entirely different. Enjoy.